Gridy adds an invisible grid on your desktop so that any window you move or resize is snapped to it. This helps maximize screen real estate by making windows placed adjacent to each other dynamically adjust to avoid overlapping. Snapping to the grid is enabled with mouse drag or keyboard arrow keys. 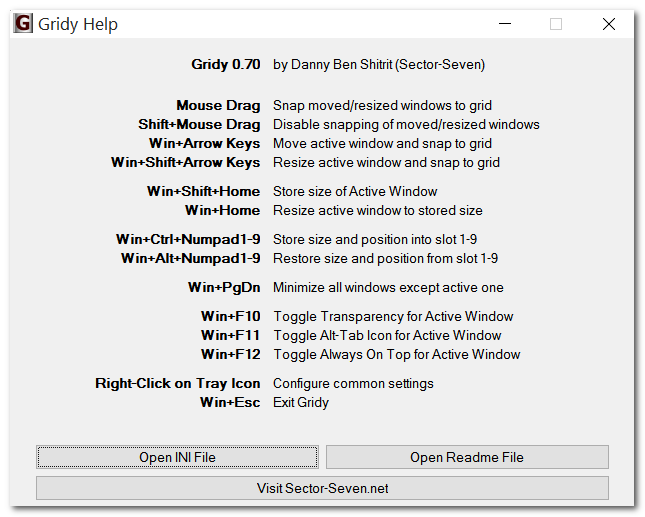 Gridy also lets you store and restore a window's size and position in up to 9 slots. This is useful for quickly arranging your windows in a convenient way. In addition, you can hide the window's Alt-Tab icon, and set any window semi-transparent or to "Always on Top." How to extract: Download the ZIP package and extract to a folder of your choice. Launch Gridy.exe. Fixed: Help dialog reported one incorrect keyboard shortcut. Changed: Help dialog will now consider all the custom keyboard shortcuts. How come no ScreenShot ? V0.60 (the .exe file is a puzzling 4x the size of v0.50) just doesn't work on my PC. Reverted to v0.50. Just upgraded from a 19" 1280x1024 to a 24" 1920x1200 monitor, and 'side by side' or 'stacked' just didn't cut it any more! A brilliant app, easy to get the hang of, I have my standard workspace of one main and three minor windows at my command. Thanks! DannyB: side-of-the-screen updates work well, although I'm getting inconsistent behavior on my WinXPSP3 UI with setting windows next to each other. Sometimes it sticks to the grid, sometimes it doesn't. The latest release has both requests - it is now aware of the screen edges (you may configure what it should do - can be to block movement, or to shrink the window so it stays visible, or to ignore altogether). Also, added a laptop-friendly configuration, to allow using the numbers instead of numpad for the preset positions feature. i used an older verson of gridy and i liked it. i forget why i stopped using it. it's still on my hard drive. i didnt have any major issues with it. maybe the cpu use was high, but i doubt it. @webfork: may be you got a notebook, so you have the "Fn" key and "Ver Nul" (on F10 key) to react as if you had "numpad". does it help? One of a growing number of window manager tools here on the site, but this one allows for much more fine-grained controls, ideal if you have more than just a few windows up. I can see this being a big help to GIMP users. The function of snapping to an area is so simple and obvious you wonder why someone hasn't come up with this before. Problems: I don't have a "numpad" so I couldn't test those functions. Also, the windows didn't automatically fill to the base of the screen (directly adjacent to the taskbar) unlike many other similar programs. Excellent little app that does as it's supposed to do. The always on top function is most appreciated.